A steady, relentless rain fell today on Canberra – which was on track Monday to receive at least half of its average November rainfall in what one local newspaper called a once-in-every-two-years “soaking.” Still, the wet weather did nothing to dampen the enthusiasm of the IU delegation as it arrived here in Australia’s capital city, the final stop on a whirlwind presidential trip that began a week ago in Tokyo. What’s more, the rains would ultimately prove auspicious for one of the university’s most productive international partnerships. One person whose spirit didn’t seem at all affected by the weather was IU President Michael A. McRobbie, who returned Monday to his alma mater, the Australian National University, where he spent 17 years as student, fellow and faculty member. McRobbie, a native of Australia who became a U.S. citizen in 2010, has maintained continuing close relations with ANU throughout his professional career, including his 10 years as IU president. 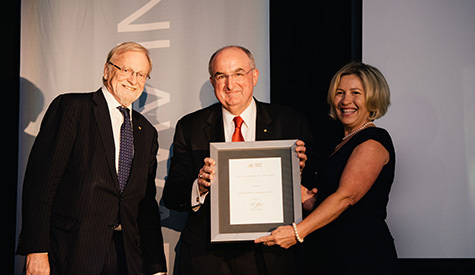 In turn, in recent years, Australia’s leading university has bestowed upon McRobbie several major distinctions, including an honorary degree and, in 2015, ANU’s Alumnus of the Year award. 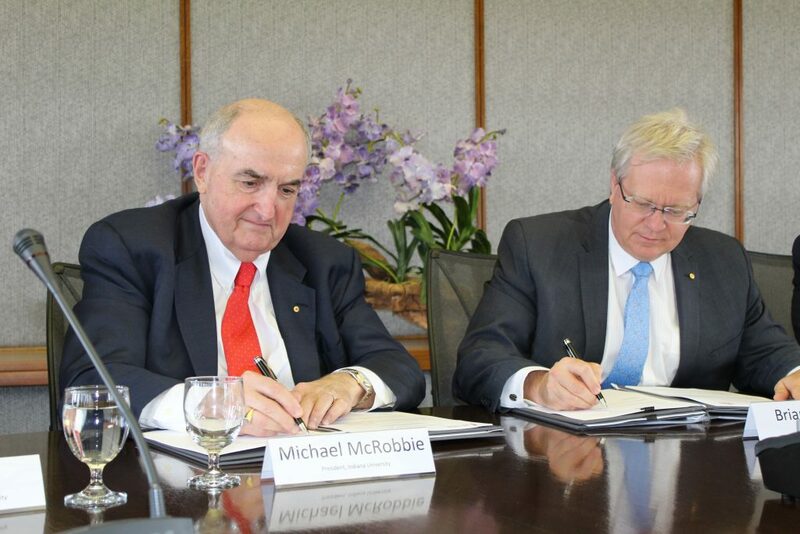 In 2015, IU President Michael A. McRobbie was recognized by the Australian National University as its Alumnus of the Year. Shortly after arriving today at ANU, McRobbie recalled a casual dinner conversation he had several years ago with then-ANU vice chancellor and distinguished neuroscientist Ian Chubb. During that discussion, McRobbie talked enthusiastically about IU’s teaching and research strengths related to almost every region of the world; but he noted that the university lacked sufficient expertise in Southeast Asian studies, an area in which ANU is considered a world leader. As the two men continued to talk, Chubb determined that ANU could benefit considerably from IU’s renowned mastery of the study of the languages, history and culture of Central Eurasia, housed in its Department of Central Eurasian Studies. Their conversation ultimately spawned a new international initiative. Since its establishment in 2009, the ANU-IU Pan Asia Institute has emerged as one of IU’s most active and successful global partnership programs. Based in IU’s School of Global and International Studies, the institute brings together leading scholars and students from both institutions with mutual academic interests in a complex part of the world that is of ever-increasing strategic importance to economic stability and global security. 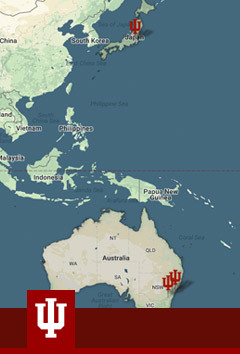 In its first year, the institute focused primarily on distance education courses in selected foreign languages (for example, Uzbek and Pashto for ANU students and Indonesian for IU students) and exchanges of students and staff. In subsequent years, the institute has convened joint workshops and supported collaborative research and scholarship on the Pan-Asian region. A midday meeting afforded McRobbie the opportunity to sit down with the institute’s newly named co-directors, IU’s Michael Brose (who also directs IU’s East Asian Studies Center) and Michael Clarke of ANU, as well as members of, among other units, ANU’s College of the Asia and the Pacific and Crawford School of Public Policy. Over the course of several hours, the group discussed ways to further enhance the institute’s mission, including efforts to facilitate greater numbers of student and faculty exchanges; deliver expertise to IU on issues concerning Southeast Asia and countries such as Indonesia, Malaysia and Thailand where the university has growing numbers of alumni; and establish an annual conference centered on major global issues, such as the rise of Chinese power in the Asia-Pacific region. While the Pan Asia Institute represents, as McRobbie called it, the “core” of the IU-ANU partnership, it is only one facet of a relationship that IU and ANU have worked to strengthen and broaden in recent years. President McRobbie and members of the IU delegation participate in a meeting at the Australian National University on issues related to cybersecurity. IU, through the Institute of International Business at the Kelley School of Business, and ANU have also worked together in recent years to support economic and educational reforms in conflict-torn Myanmar. 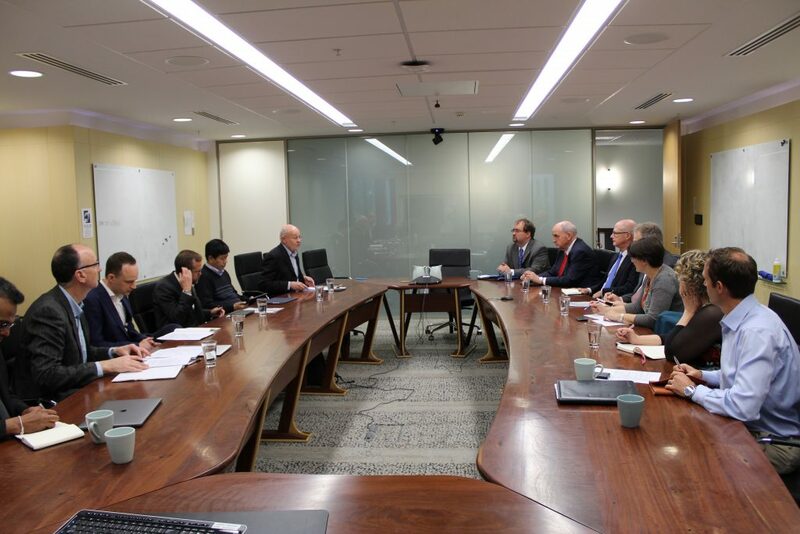 Other recent collaborations between the two universities include exchanges between ANU and IU’s Clinical and Translational Sciences Institute and between the ANU National Security College and the IU Center for Applied Cybersecurity Research. Indeed, the topic of potential research collaboration in cybersecurity took center stage at two meetings today – one intended to initiate exchanges among IU and ANU faculty in computer science, business, IT engineering and law and another to address more stringent safeguarding of massive amounts of important scientific data. The latter discussion took place at the National Computational Infrastructure at ANU, which operates Australia’s fastest supercomputer, highest-performance research cloud and largest repository of data. On Monday, members of the IU delegation were joined in Canberra by nine IU faculty members at a second annual IU-ANU summit meeting. 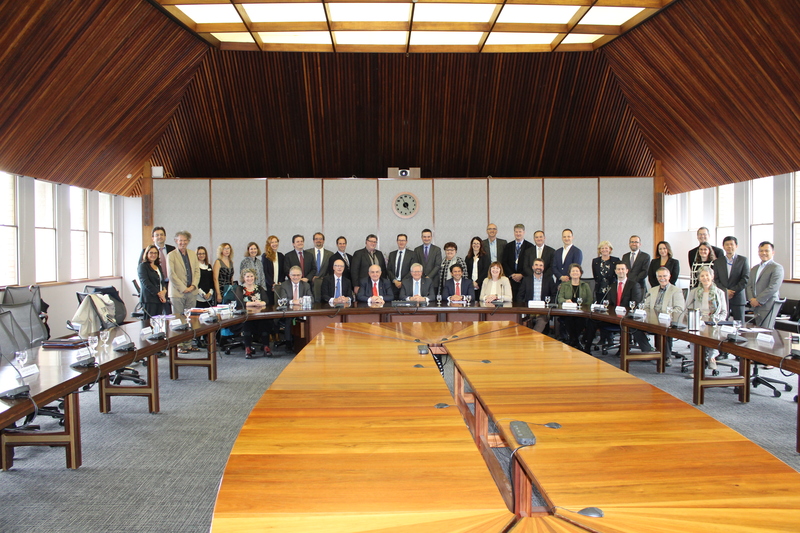 In the days leading up to the delegation’s arrival, the IU faculty had been meeting with their counterparts in several ANU schools to discuss potential collaborative activities spanning a wide range of academic areas, including art and design, business, cybersecurity, law, linguistics, public affairs and public health. President McRobbie and ANU Vice Chancellor Brian Schmidt formally renew a partnership agreement between their respective institutions. McRobbie and ANU Vice Chancellor Schmidt convened this afternoon’s summit, opening the floor to their respective faculty so they could briefly present their plans for new teaching and research collaborations and point out where the greatest potential exists to develop increasingly important comparative perspectives on the most critical issues impacting both the U.S. and Australia. Attending the summit and speaking on behalf of IU’s academic and research units were Michael Brose; Damir Cavar, Department of Linguistics, College of Arts and Sciences; Lesley Davis, IU Maurer School of Law; Carrie Doherty, School of Public Health-Bloomington; Margaret Dolinsky, School of Art, Architecture + Design; Beth Gazley, School of Public and Environmental Affairs; Carolyn Lantz, College of Arts and Sciences; LaVonn Schlegel, Kelley School of Business; and Von Welch; Center for Applied Cybersecurity Research. McRobbie then joined Schmidt in a ceremony where the two university leaders formally renewed the IU-ANU partnership agreement, which will now extend into IU’s bicentennial year celebration in 2020, capping an exhausting and exciting day here in Canberra, where even a driving rain couldn’t hide the bright future ahead for one of IU’s premier global partnerships.